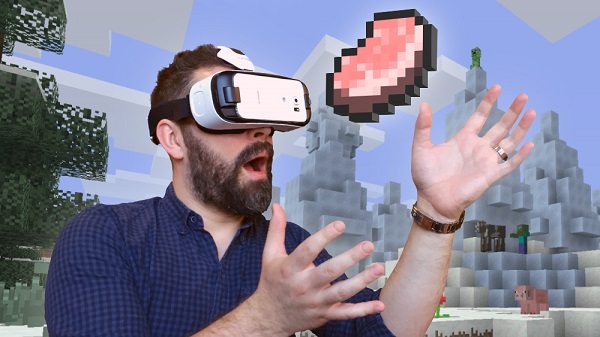 Minecraft arrives on Samsung's Gear VR. Get your goggles ready! You can now play Minecraft on Gear VR-compatible Samsung phones - the Galaxy S7 or S7 edge, Note5, S6 and S6 edge. It works by slotting your Samsung phone into the Gear VR headset and displaying one whole Minecraft world to each of your eyes! If you have the Samsung S6 or the snazzy new S7, the screen resolution is pretty fabulous - so you won't be easily distracted by the pixels. Older phone models might not run the game quite as well in true stereo or with as high a draw distance, but it's always amazing to plug yourself into the world of Minecraft without any cables tethering you to a PC. Virtual Reality (VR) edition of Minecraft has all the features of Pocket Edition, costs the same and has cross-platform play with regular Pocket and Windows 10 editions.